IDENTIFY Background Miss Darling is the president of a girl-scout group called the Green Peacocks. The Green Peacocks was established in 1960 by her grandmother Mrs. Darling. This club was created to teach young girls between the ages of 5 - 16 years the usefulness of friendship, teamwork and training. The club is located in North Finchley. Statement of the problem At the moment, the Green Peacocks are attended poorly because of the insufficient equipment and facilities and advertisement. This is because the leaflets are hand-written which is boring and hard top understand. Most of the time, people throw the leaflets away because they don't understand the writing and think it is too boring. This year she wants me to create a leaflet containing the aims, activities, places visited and the awards achieved at the end of each year. Consideration of Alternate Solutions 1. A leaflet could be designed and written up by hand and then photocopied and handed out to people. This leaflet would contain all the necessary information but the problem with this idea is that the information may not be clear and the leaflet will be very unattractive. 2. A word processor could be used to type up the leaflets as well as insert graphics and fancy headings. This solution will be better than using freehand and it will look more professional. This solution is not as good because this computer package is not as flexible as using a desk top publishing package. 3. The best and most important alternative solution is the ICT solution using the chosen package- in this case is the Microsoft publisher. The desktop publisher can be used to type up leaflets and insert graphics and fancy headings. 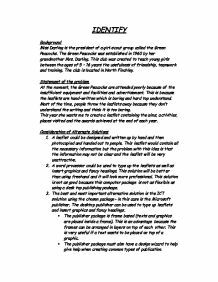 * The publisher package is frame based (texts and graphics are placed inside a frame). This is an advantage because the frames can be arranged in layers on top of each other. This is very useful if a text wants to be placed on top of a graphic. ...read more. Data Required What to insert into the leaflet Where to get the information from How to insert the information into the leaflet * The information about the Green Peacocks I will get the information about this group from the president, Miss Darling; I could even ask the founder of the club, Mrs. Darling. I can also get the information from their website. I will first type in all the information I acquire in the word package (Microsoft word) and then transfer it to the publisher package into a text frame. * Pictures of the Green Peacocks I will get the pictures from a magazine about the girl scout group. I can also get the pictures by transferring the images from a digital camera I will scan the pictures using a scanner. I will save the images in a .jpg (Joint Photographic Experts Group) because these files compress the pictures and save them in a very small space. I will then manipulate the pictures to the way I want and I will paste them in the publisher * Logo I can create a logo for the leaflet on A4 paper or I could create a logo in paint pro shop and store it on the computer. I will scan the logo o created by hand into the computer and store as a .jpg file. I will then manipulate it and insert it into the publisher. * Comments from past Green Peacocks I will interview past Green Peacocks and ask them for their opinion about the club and how it helped them I will type up the information in the word package and then transfer it to the publisher package into the text frame. * Application form I will create an application form for the leaflet for those interested in joining the Green Peacocks I will type in the information in the word publication and transfer it to the publisher and insert it into a text frame * Table showing the details about the fees I will get all the statistics from the president of the club. ...read more. 6. There was only space for five pictures of past and present Green Peacocks and there was only space for six comments about the club from past and present members of the club. 7. The map was spread out on one of the pages of the leaflet so people with seeing defects will be able to see it without aids. 8. The logo is on every page of the leaflet. 9. The spelling and grammar is fine as there is no error on any page. 27 High Road, North Finchley, London, NW4 5XB. 16th October, 2005. 7 Upper Cavendish Avenue, Finchley, London, N3 3NN. Dear Miss Sa'id, I have taken a look at the second leaflet created and I really like what you have done to the leaflet. It is really beautiful and it is Green Peacock standard. The pictures look great in their new position and have been given a really colourful border. The font is the right and easy to read. Thank you for adding the picture of my mother with her girls. It really brings back memories and establishes a sense of security to parents because they know the club has been around for some time and they can trust us when we say we know what we are doing. There should be some enhancements to the leaflet. A questionnaire was giving out regarding the leaflet. The answers of the questions were gathered and the following feedback received: 1. all of those questioned thought that the design was appealing 2. everyone thought that it would be easy to carry around (fit into a pocket or a hand bag) 3. The leaflet was generally easy to read but a few people with impaired vision thought the font was too small. 4. This solution proved to be better than people standing in the street with blackboards hanging over their shoulders. 5. many suggestions for enhancements said : "The address of the club for meetings should be included in the leaflet" I believe all the improvements have been taken into consideration. Yours truly, Miss Darling. ?? ?? ?? ?? ...read more. I liked my idea of making a video the most, but I think that wouldve have been professional looking because I didn't have real actors, or the right space, Nor the right props. Therefore I think It woudlve looked very amateur and the message wouldn't have reached my target audience with the bang I would be looking for! As a result of this I had to give my designs to a specialised printing company where they were able to successfully use this printing method to create my final design on plastic as a key-ring. Below is a copy of letter I sent: Dear Sir or madam: I am a year 11student at Hampstead School. I would be very grateful if you could help with research for my GCSE Graphics Technology coursework, by sending me any information on your range of toys, for example, safety regulations, materials used or the making of toys. Why do the Japanese make better cars than us? Some say it's because their culture encourages cooperation. That may come into it. But in this case it seems more to the point that their culture prizes design and craftsmanship. For centuries the Japanese have made finer things than we have in the West. From the interview I established key areas of what my mother wanted the forthcoming leaflet to be like and the first aspect we discussed was the target audience. She wants to appeal to customers of all ages therefore the leaflet would have to be modern yet professional in order to capture the attention of both ends of the scale. Design week, Caped Crusader Magazine Review. These are set out in a clear, neat and informative way. They comments on people's comments and thoughts like "Value your work in this competitive global economy. They also gives a more detailed article about Mail Order retail in decline as internet shopping booms. or modified for new releases, possibly as a consequence of physical properties of their support media." (Rossi et al) Rossi goes on the say that, the growth of technology and the Internet has made necessary the need for applications that can be modified, improved with new services, new navigation and interface features.